‘The noblest art is that of making others happy,’ wrote PT Barnum, the world-famous nineteenth century American showman and entrepreneur. 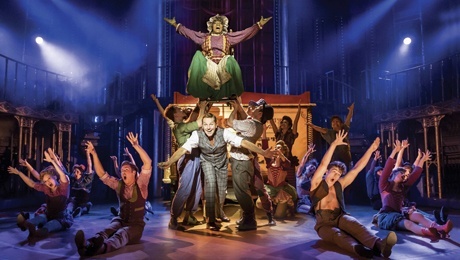 Over a century later he has been brought back to life in a Cameron Mackintosh-produced piece of musical theater, which guides the audience through the chief moments of his rather colorful adult life. 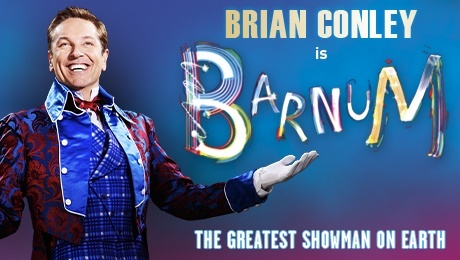 Barnum, the lead character, is played by the buoyant Brian Conley, who struts the stage with charisma & playfulness, and at times a quite flawless American accent. In front of a set simply dripping with plush red velvet, Conley banters effortlessly with the audience, generating loads of laughs and is the driving force behind the incessant energy of the show. Conley is accompanied by a talented troupe of acrobats, strong men and jugglers, who spend time wowing the crowd in the aisles before the production even begins. Between them they conjure some incredible showstoppers, allowing three drawn-from-real-history acts their time to shine, being Joice Heth, the oldest woman alive (big bluesy mama), the ‘Swedish Nightingale’ opera soprano Jenny Lind (stunning ice queen) & Tom Thumb (petite & outrageously camp). The latter provided a wonderful piece of stagecraft, when a giant was trundled onto stage in order to suspend disbelief for a snappy musical number, while giant elephant feet were lowered onto the stage, with a trunk spraying water on the crowd.